Novori is committed to ensuring that the diamonds we sell on our web site are non conflict diamonds (also called conflict free diamonds). We have asked our diamond vendors to confirm to us that they will not knowingly sell conflict diamonds and that they fully participate in the Kimberley Process. This is important to us for a number of reasons. We want to know that the diamond industry is not placing at risk innocent victims or causing turmoil in impoverished nations. The diamond industry should be a provider of economic wealth to nations who are participants in the industry. That will make sense for the nationals, the diamond industry and for us as a retailer. It also provides you with the peace of mind of knowing your diamond purchase is an untainted symbol of love. You can search our list of conflict free certified diamonds. Some years ago the diamond industry was lacking proper regulations to ensure the mining and distribution of diamonds was adequately controlled. This allowed rebel leaders to take advantage of smaller impoverished countries to forcibly finance their war activities with diamonds. This is where the term "Blood Diamonds" or conflict diamonds came from. The Kimberley Process was developed to control the movement of diamonds throughout the world, and to track the movement of diamonds from mine to market. Effectively this would control and eliminate blood diamonds from the marketplace. The international community, including the UN General Assembly and Security Council, and the World Trade Organization, have all recognized the importance and effectiveness of the Kimberley Process in the fight against blood diamonds. In 2003, President Bush signed into law the "Clean Diamond Trade Act". Novori stands behind this Act and commits to compliance of the Act. In 2006, Blood Diamonds the movie starring Leonardo DiCaprio, Jennifer Connelly and Djimon Hounsou was released which graphically portrayed the situation in one conflict diamond region, Sierra Leone during their civil war in 1999. 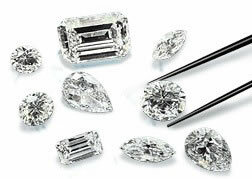 Today, over 99% of the diamonds sold are from conflict free sources. Work is being done to tighten up the Kimberley Process and make it even more effective. Novori is committed to ensuring that the global diamond industry is a safe environment for all involved. We are committed to following all legislation and best practices to ensure that all our diamond sources deal only with conflict free diamonds. The World Diamond Council has an excellent web site with many facts on conflict diamonds and the Kimberley Process time line at their DiamondFacts.org web site. You can find more information about the Kimberley Process and Blood Diamonds. Novori is a registered jewelry with the Stop Blood Diamonds Organization. Again, we do all we can by working with our diamond suppliers to ensure all diamonds sold on our web site are conflict free diamonds.